Carol Caputo is an artist who works in a variety of media. In a search for new methods to "read the city", Caputo creates intense personal moments masterfully created by means of rules and omissions, acceptance and refusal, luring the viewer round and round in circles. Her artworks establish a link between the landscapes'reality and abstract impressionism. By applying abstraction, she investigates the dynamics of photographic landscape, manipulated with drawing and paint to change our assumptions of what landscape means to us. Rather than presenting a factual reality, an illusion is fabricated to conjure the realms of our imagination. Her works are often classified as part of the new romantic movement because of the desire for the local in the unfolding globalized world. However, this reference is not intentional, as this kind of art is part of the collective memory. By exploring the concept of landscape in a nostalgic way, she creates work through labour-intensive processes which can be seen explicitly as a personal journey. Inspired by a nineteenth-century tradition, her romantic urban works are often about connecting architecture with basic living elements. How we connections is essensial to humanity. 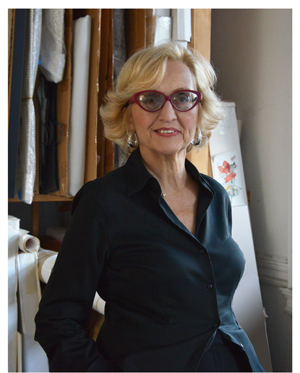 Carol Caputo's career is a collage of award-winning creative projects. as well as in numerous galleries. IRUBNY, Community Arts Initiative inspired by the work of Carol Caputo. and the Museum of Art and Design community outreach programs. A documentary, titled, IRUBNY has been featured in many Film Festivals. Impressions Of the City, was published in 2015. ©2016 Carol Caputo. All rights reserved.